Provides attunement to and the instruction and descriptions for the 26-chakra energy system. Teaches you how to recognize and Understand your own “Soul wounds” or Soul level energy imprints. Learn how these “wounds” or energy imprints are carried into your everyday Life as a part of your personality, your fears, your phobias, and even your body. Learn how to Heal at the Soul level (current, past, and future lifetimes) through the akashic records, which in turn Heals your Life, as well as past and future lives. Learn how to see and live Life from the Soul perspective, instead of the human perspective, and how it is possible to Transcend your Karma. Attunement and symbols required for this level of Healing are provided, along with practice of self-Healing at this level. This is a six to eight hour course which is only taught with OHT Sixth Degree training (two days combined). 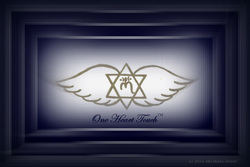 ​An invitation from the One Heart Touch® Grand Master or a certified One Heart Touch® Master Instructor following the submission of your inquiry/application. Thirty (30) days after completion of OHT 3rd Degree training. This waiting period affords the initiate the opportunity to fully assimilate one series of energy attunements before receiving the next. Provides the attunement and symbols necessary to Heal at the level of the Soul for others. Learn how to apply the information and instruction provided in the Fifth Degree training to others through Healing facilitation sessions. Learn the ethics and etiquette of Healing at this level, what role Karma plays in the Healing process, and how to assist another through the Healing at the Soul level (akashic records) to Transcend it. Begin learning basic Universal Laws which apply to this level of Healing. Learn to recognize when another’s Soul may be asking for your help in its Healing process through dreams, etc. Practice of Healing facilitation sessions is included for in person and distance sessions for this level of Healing. This is a six to eight hour course which is taught only with OHT Fifth Degree training (two days combined). An invitation from the One Heart Touch® Grand Master or a certified One Heart Touch® Master Instructor following the submission of your inquiry/application.